Kundalini-Yoga aims at the union of man with his transcendental, divine Self. To realize this goal it uses a synthesis of various paths of Yoga: the base is Hatha-Yoga, the forceful Yoga of power and exertion, combined with Bhakti-Yoga, the Yoga of devotion and love, Karma-Yoga, the Yoga of action, and Jnana-Yoga, the Yoga of knowledge and wisdom. 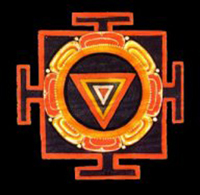 The practice of Hatha-Yoga can result in the unique phenomenon of setting this Serpent Power in motion. “Kundalini” is a mysterious, abstract concept of Yoga, signifying the “Grand Potential”. Even in spite of the great scientific, parapsychic and metaphysical interest it remains an enigma to modern science and medicine. The awakening of this dormant force results from the integration of the autonomous and voluntary nervous system, whereby the responses to the external and internal world are integrated. This causes motivation of many unsuspected and unexperienced faculties, which can lead to Self-realization. Practice of Yoga bestows a threefold gain upon the aspirants: Physical strength, intellectual acumen and spiritual development. If somebody does not care for spiritual values, no matter. Spiritual development dawns automatically upon a person who succeeds in fully developing his or her physical and mental talents.